With Easy Button & Menu Maker you can easily create sophisticated buttons and professional dynamic menus for your website while investing just a few minutes of your time. More than 100 elegant design templates are included, reflecting various design styles such as so called Glass and Vista style. 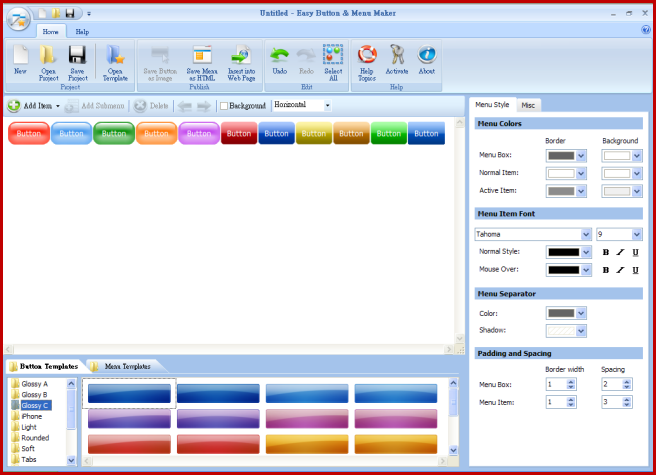 Unlike most other menu tools, Easy Button & Menu Maker provides direct WYSIWYG visual menu editor, so it is much easier and pleasant to work with. Menus created with Easy Button & Menu Maker are quick, compact and compatible with all modern web browsers.